Some outrages are worse than others. Still, why should we set one injustice against the other, as though seeking greater exhibitions of revulsion at the one oppression or injustice than at the other. And yet we do. The murder of Eric Garner last year at the hands (literally) of one of New York’s “Finest” is one such outrage. It stands out from the “normal” horror story, so beyond the pale as to be unspeakably inhuman. Equally outrageous is the sentencing by the regime in Saudi Arabia of Ali Mohammed al-Nimr to death by crucifixion and beheading (!) for his participation in “Arab Spring” pro-democracy protests in 2012. Ali was 17 years old when arrested and tortured. 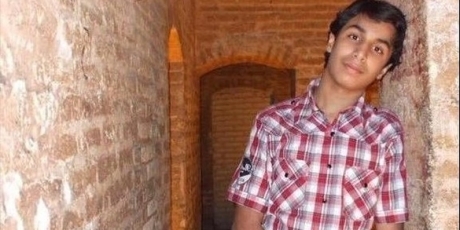 (Support Ali Mohammed al-Nimr HERE.) Meanwhile, the Saudi regime continues to receive billions of dollars each year in “foreign aid” and military hardware from the United States. Saudi Arabia was just chosen to head the United Nations Council on Human Rights. And this week, just in time for Yom Kippur (Days of Atonement), we learn of Israeli soldiers’ assassination of 18-year-old Hadil Salah Hashlamoun at a checkpoint in Hebron. An image published by Youth Against Settlements shows Hadil Hashlamoun surrounded by Israeli soldiers at a checkpoint in Hebron. Note the wood fence Hadil would have to climb to get past the guards. Hadil was ordered to open her bag. When she did, an Israeli soldier screamed at her in Hebrew (which she did not understand), and shot her in one leg and then the other, and other soldiers opened fire on the poor girl. She collapsed and, while still alive, her body was dragged over the ground to a corner where she waited for more than 30 minutes for an ambulance (while Israeli emergency personnel stood by joking with the soldiers). She died later in the hospital. al-Hashlamoun had her hands inside her niqab (full-face veil) throughout this entire period and at no point tried to approach any of the soldiers. The four soldiers who had just arrived pushed Abu Aisheh 3-4 metres back and refused his offer of translation. At this point, according to Abu Aisheh, the girl was behind metal rails separating her from the soldiers and the same soldier who had fired the first shots moved back, dropped to one knee, and shot al-Hashlamoun in her left leg. According to Abu Aisheh, she fell to the ground and dropped her bag, as well as a knife with a brown handle that she had been holding under her niqab. The first witness, who was slightly farther away than Abu Aisheh, did not see any weapon. According to Abu Aisheh, the soldier who had shot first got up and moved closer to her, until he was about a metre away, and then shot at her upper body four or five times again while she was lying motionless on the ground. He said that the soldier shot a few times despite other soldiers yelling at him to stop. The first witness also described the soldier moving closer to al-Hashlamoun and shooting her in the chest. Even if al-Hashlamoun did have a knife, Israeli soldiers, who are protected with body armour and heavily equipped with advanced weapons, could have controlled the situation and arrested her without threatening her life. Open fire regulations of the Israeli military in the occupied West Bank allow soldiers to open fire only when their lives are in imminent danger, and Amnesty International concludes that this was not the case in the shooting of al-Hashlamoun, as she was standing still and separated from the soldiers by a metal barrier. There was no attempt to arrest al-Hashlamoun, according to the eyewitnesses, or to use non-lethal alternatives. To then shoot al-Hashlamoun again multiple times as she lay wounded on the ground indicates that her killing was an extrajudicial execution. Such utter disregard for human life! The Israeli soldiers are reminiscent of the Chicago police force — another (but similar) kind of occupying army — in December of 1969 following their murder (while he slept) of Black Panther organizer Fred Hampton, snickering as they carried away his body. Chicago police carrying out Fred Hampton’s body, after they assassinated him while he slept, on December 4th, 1969. I want to make it clear to the world — or at least anyone who cares to read this blog: This Jew (me) is outraged at the behavior of the Israeli occupation forces. I — and many other Jews — denounce such inhumanity, such callous disregard for the life of another human being. They claim to be doing this in my name and in the name of all Jews everywhere! I am numb. Not in my name! Their actions (and the policies that led to them) are horrible beyond all comprehension. I have only one question: Checkpoints? When did we, as human beings, come to accept permanent checkpoints as legitimate “standard operating procedure” to begin with?